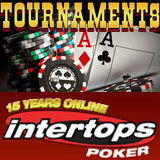 Intertops Poker is spicing up the weekend with added and guaranteed cash. $3000 is up for grabs in a full schedule of poker tournaments. Intertops was one of the first online poker, casino and sportsbook sites on the internet and has been trusted by players around the world for more than fifteen years. Intertops Poker takes pride in its friendly customer service and hassle-free deposits and withdrawals and gives away tens of thousands of dollars in casino and poker bonuses every month. You can also watch my online gambling news on my YouTube channel. I also publish a poker players blog called Living the Dream. Gamblogger. Simple theme. Powered by Blogger.